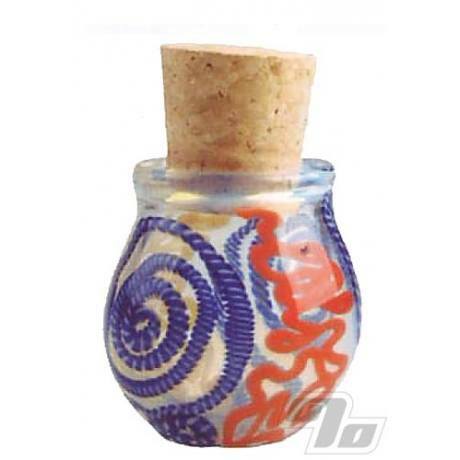 Glass jars store your smoking material the time tested way; glass with a real cork on top. Odor-proof, airtight and humidity resistant, these glass jars lock in freshness and smell of your herbal blends and loose tobacco. The glass is blown inside out for added strength, durability and designs deep within for effect. Really nice stash jar, given as an early Christmas present. GREAT LITTLE PERSONAL STASH JAR! This is a great quality jar and is just the right size. Alot bigger then I thought, holds alot of "stuff", looks cool and is air tight! Great little stash jar arrived 2 days after it was shipped. Great people to do business with, will buy from again in the future. I love it! Very retro!